SanDisk Sansa Clip review | What Hi-Fi? Packing 8GB of internal memory, the SanDisk Clip is seriously capacious for its size. 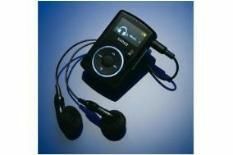 As well as a small clip on the back of the player, an FM radio and voice recording functionality are included. The Clip feels cheap, but the compact design, responsive controls and illuminated display all combine to produce an intuitive little device. Unlike some weaker players, high frequencies don't sound too shrill and tinny, but we'd like greater overall detail and definition.